If you follow me on Instagram, you know that last week was my Husband's Birthday, which in our house means lots of Birthday cake! The running tradition in the Bell family is for my Husband's Grandma to bake a yellow cake with homemade chocolate frosting. And, the running joke is that her frosting is simple yet no one can replicate exactly how she makes it. This is the 8th Birthday that I am celebrating with my husband, and that means 8 tries at his Gramdma's cake. Since we don't live close to family, and I still haven't been able to nail it just right, I decided to save myself and make an incredibly easy (and cute) alternative. A mini funfetti cake! Another motivation for making a mini cake was because we were leaving the next day to go out of town for a couple of days. And, who doesn't love their own personalized cake for their Birthday? Are you ready for the incredibly easy directions? Mix 1 box mix of funfetti cake according to the box directions, grease an emptied soup can with baking spray and pour the cake mix into the soup can filling it halfway (I filled mine 3/4 of the way since I wanted a taller one). Put the filled cans on a baking sheet and place in the oven at 350 degrees for 30 minutes. Once they are fully cooked through, remove them from the oven and let them cool completely. Once the cake has cooled completely, run a knife around the edges and carefully release it from the can. Using a serrated knife, cut the cake into 2-3 layers (depending on how large it is) to frost it. 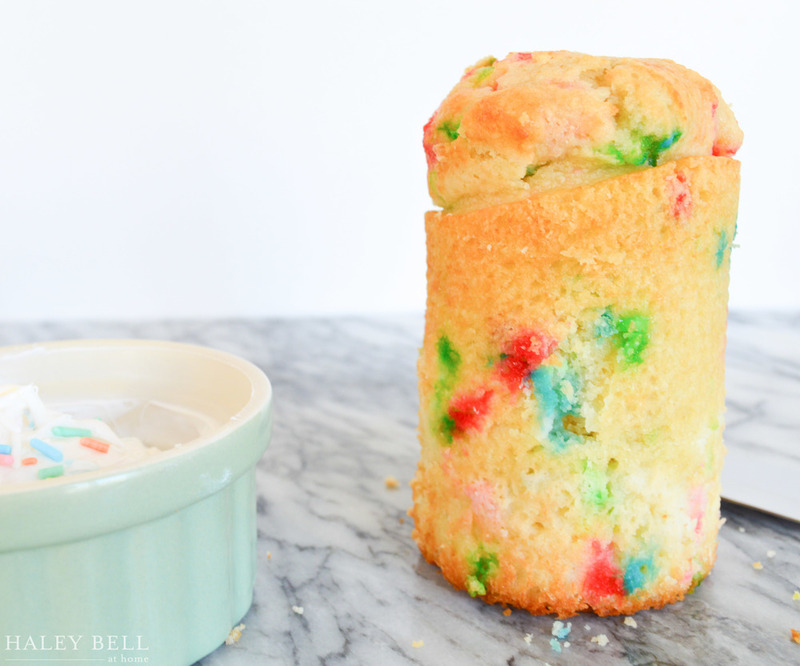 Mix the sprinkles in with the funfetti frosting and frost away! I chose to do mine "naked" style leaving the sides exposed, but you could certainly cover the whole thing in frosting. 1 box cake mix yields about 4 cakes, depending on how much batter you pour into each. This Birthday was incredibly special and it made me realize that it's not always about how many hours you spent in the kitchen preparing. Be it from scratch, a box or a bakery. What really matters is feeling celebrated and being together. This year I focused on that, relieving myself of the pressure of making his Grandma's cake, and maybe even starting our own tradition (we'll see! ).